In Buddhism, humility is associated with being liberated from any suffering or anguish in life. 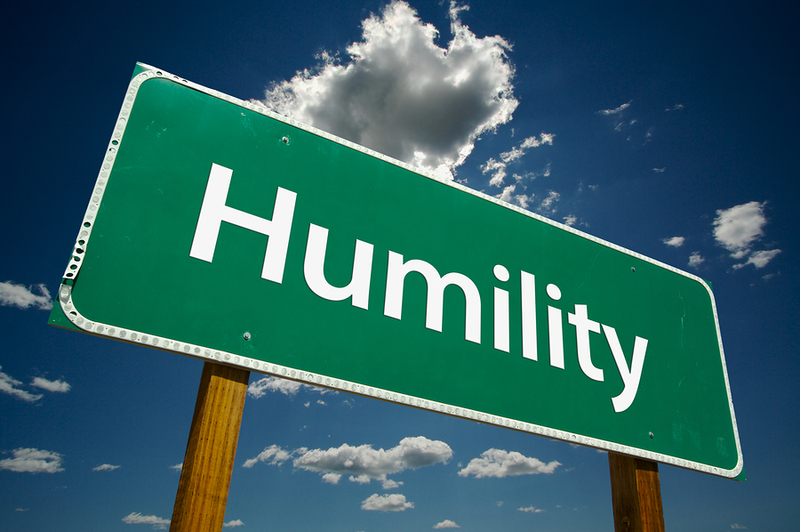 In Christianity, humility is defined as recognizing one’s own defects, and holding a humble opinion of oneself. And, in Islam, humility translates to surrender. Not unlike world religion, disability also contains humility as an ultimate form of being, where we recognize our limitations not with resentment, but with gratitude. And, it’s that gratitude – our humility – that allows us to have grounded perspectives in life regarding what’s truly important, where life can prove to be more about our connections with others, and less about status or materialism or physicality. At the core of humility is humbleness, and few plights in life are more humbling than living with a severe disability. While those with disabilities are not precluded from achieving the trappings of the ego – recognition, success, wealth, and so on – disability is remarkably grounding for many, far canceling out any pretentiousness in most cases. For example, one may be very blessed with a well-paying career and success, but that doesn’t alter the reality that having to rely on others for physical care is a universally humbling experience. However, the humbling realities of disability don’t have to be troubling as some express, but can actually be liberating, increasing our capacity to connect with others, our humility. Again, rooted within humility is the wisdom that none of us are of ultimate strength or infallibility, but that we all have weaknesses and needs. Put simply, disability, by nature, allows us to inescapably see our weaknesses – which is actually a strength – giving us the humility to respect the plights of others beyond our own challenges. I was recently working the Abilities Expo in downtown Los Angeles, and had a wonderful walk each morning – about a mile and a half – from my hotel to the convention center. The weather was beautiful, so it was a refreshing start to my long days by racing my power wheelchair past the skyscrapers of downtown, weaving my way through crowds of commuters on foot and darting across hectic, traffic-filled intersections. One morning, I came upon a homeless man sleeping on the sidewalk. He especially stood out to me because he was exceptionally dirty, with no possessions, sleeping on the bare concrete – a contrast to the many other homeless that I saw who had sleeping bags and shopping carts full of clothing and such. With so much going on – racing to a trade show, city traffic buzzing around me – his presence literally brought my world to a halt. With time to spare, I went in the coffee shop around the corner, bought two breakfast sandwiches, two cartons of orange juice, and grabbed a straw. I then returned to the homeless gentleman, waking him up, offering him breakfast. He didn’t say much, but he accepted the breakfast sandwich and juice. In my shirt and tie, I sat there with him, carefully eating my breakfast sandwich, as not to spill on my clothes. I didn’t, however, open my juice because it was beyond my dexterity – I reckoned I’d save it until one of my colleagues at the convention center could open it for me. We sat there silently eating – folks passing us on the sidewalk – when, suddenly, the homeless gentleman took my orange juice carton and straw off of my lap, opened my juice, put the straw in, and observantly gave me sips on queue, following my bites. What struck me was the remarkable humility in the gentleman. Although he was more down on his luck than arguably anyone in Los Angeles – and who knows how or why? – he still had the humility to recognize my needs, graciously serving me my orange juice when I could not. No, I can’t entirely explain why I stopped in my tracks that morning to have breakfast with that gentleman, but I know that it fit somewhere in my disability-based understanding that my plight in life is no more worthy than anyone else’s, that if I was to have breakfast, so should the gentleman sleeping on the sidewalk. However, what truly inspired me was that despite the gentleman’s seeming needs, he recognized mine in accordance with his own via the very nurturing act of helping me with my juice, words unspoken. It’s easy to think we’re above others based on status, and it’s even easier to think we’re beneath others based on our seeming weaknesses, including the humbling aspects of disability. And, yet, it seems so hard for many to simply realize that we all share a common humanity, where shared humility brings us together from all walks of life, right down to a guy with cerebral palsy having breakfast with a homeless gentleman on a sidewalk, where both find gratitude in the challenges of life where others may not.